I have visited Karazhan so many times I had forgotten about the enchanting formulas that dropped in there. Until tonight, that is. Tada! Enchant Boots - Surefooted are mine! A couple more to go...where are you Soulfrost and Sunfire? Darklight Resolution had their weekly Guild Night last night and I had the pleasure of leading a raid on Zul'Gurub. We started small, worked our way up to 15 people, and ended with the Panther Boss at 10 men and women. We quickly blasted through five bosses and Ghaz'ranka (no, Polymorph: Turtle did not drop). We saw tons of coins and bijous and in the end, I ended up with 2,858 reputation with the Zandalar tribe, just 142 reputation short of friendly, or just 142 reputation short of Pattern: Bloodvine Boots, Formula: Brilliant Mana Oil, and Zandalar Illusionist's Wraps. The cuffs dropped twice, so after giving the first set to the level 60 mage, Nightsage that accompanied us, I grabbed the second set. Yet another item to fill up my bank, but that set would look pretty good. Running the numbers again, my new War Staff I plan on picking up next week will grant me 1 additional hit, 42 additional crit, 40 additional damage, and 29 resilience at the cost of just 6 stamina and 9 intellect. A very simple tradeoff to make. However, right now, I can purchase the Merciless Gladiator's Spellblade and combine it with either the Jewel of Infinite Possibilities (which I own) or the Fetish of the Primal Gods (which I have the badges to purchase). The other option is the Flametongue Seal (which gives the most pure damage). What it basically comes down to is trading some stats for damage. In the end, the War Staff is the best option. However, if I were to spend 1,125 more arena points to put the Spellblade with the Vengeful Gladiator's Endgame, the net effects are: plus 3 stamina, 35 damage, and 16 resilience at the cost of 3 intellect, 9 hit, and 42 crit. An interesting tradeoff, but I think keeping the hit and crit for raiding is the best option. Over the weekend, besides fishing, I also joined a 3v3 arena team. Lexten, Panoply and I tried our hand at some 3v3 with extreme DPS and it didn't work out too well. Boomkin+2 mages =/= success in 3v3 apparently. But we got our 10 games in (2-8) and also proceeded to get in the requisite number of matches for 2v2 and 5v5 play. This week I should be pulling in 700-800 arena points, adding to the 2,000 I had previously. The Merciless Gladiator's War Staff is just 3,261 arena points, so this time next Tuesday, I should be able to upgrade to it. This Thursday, I'm trying to organize a run into Zul'Gurub. It's been quite a while since I've ventured inside, but it is one of my favorite places to go and I'm hoping to get a few guildmates inside and down some bosses. 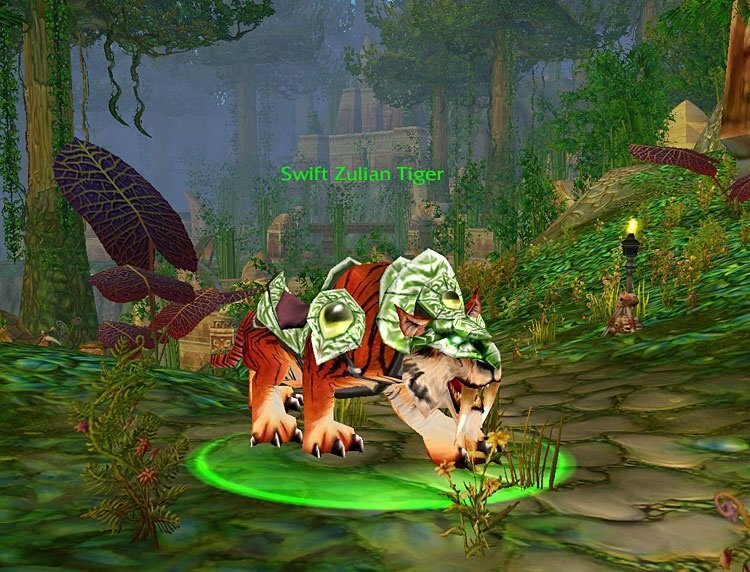 One can never complain about getting what is probably the coolest mount out there - the Swift Zulian Tiger. Ahh! So angry I can't get a Green Winter Clothes Pattern! They're a horde only item. I get my Red Winter Clothes, but really want both. Today was fishing day. I finally had enough of that measly fishing skill of 17 showing up whenever I looked through my list. I started out in Stormwind fishing the canals and then moved on to Southshore once I had skilled up enough. There I traveled up and down the river fishing for sagefish. I fished a bit in the Arathi Highlands and finally moved on to the Hinterlands where I came across some electric eels in addition to all the other fish I was exposed to. When I hit 210, I traveled to see Nat Pagle in Dustwallow Marsh. He refused to give me the quest to advance until I hit 225, so I fished off his dock for a while. He then had me search across both continents to find a Feralas Ahi, a Misty Reed Mahi Mahi, a Sar'theris Striker, and a Savage Coast Blue Fin. They were relatively easy to fish up and I returned to Nat Pagle ready to continue my fishing learning. I am now at 225, gaining over 200 skill points today and on my way to 375. Then I shall try my best to acquire Mr. Pinchy.